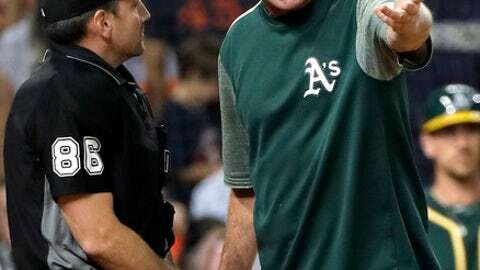 Bregman homered twice and his tapper just in front of the plate in the 11th inning led to a bizarre sequence that ended the game, as Lucroy’s throwing error handed the Astros a 6-5 victory over the Athletics. With one out, Bregman’s dribbler started out foul before spinning into fair territory just a few feet up the first base line. Bregman failed to run initially, so Lucroy scooped up the ball and reached for Bregman as he backpedaled – the bat still in his hand – in an effort to dodge the tag. But the ball slipped out of Lucroy’s bare hand, pinballed off plate umpire David Rackley and Lucroy, and then fell to the ground. Still with plenty of time, though, Lucroy picked up the ball, set his feet with an angle to throw to first base – and fired the ball off the back of Bregman’s helmet as he ran up the line. Rondon struck out Piscotty before a wild pitch left runners at second and third. There were two outs when Semien’s second double of the game tied it at 4. It’s the first career selection for the 11-year veteran.